1…a1Q? 2.Rc7+ Kg8/Kh8 3.e7 Qd1+ 4.Kg6+-or 1…g1Q? 2.Rc7++-, see 1…a1Q? 7.Re8+ Kh7 8.Re7+ Kg8! 9.Re8+! 12…Kh7 13.Rf7+ Kg8! 14.Rg7+ Kh8! [19.e7? Qd7 20.Kf8 Qxd6 21.f7 Qc5! 22.Ke8 Qc8# mate; 19.Ke7? Kg8 20.d7 (20.f7+ Kg7 21.d7 Qc5+ 22.Ke8 Qf8# mate) 20…Qc5+! 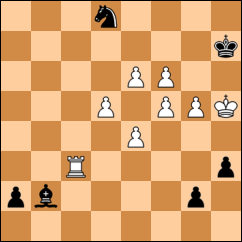 21.Ke8 Qf8# mate] . Large sized study. Refusals to capture undefended pieces. Various tries. Sacrifices. Zugzwang. Strong counter-play by Black. Fight to promote. Promotions to Queen. Play covers all the chessboard. Positional draw.